There are all kinds of bad bosses out there, but reading the Gervais Principle has warped my mind a little bit. I can’t help but see organizations in terms of this model now and it is sort of freaky. If you haven’t read this, I’ll give you enough for this article to make sense, but I highly recommend it. 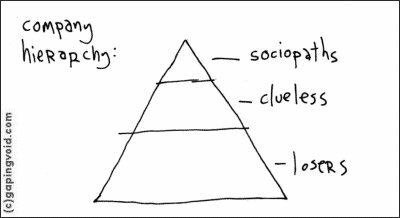 The Gervais Principal is based on this sketch by Hugh McLeod which explains an organization in terms of three kinds of people. There are the losers at the bottom who have made a financial trade off for any number of reasons but usually it is stability, the clueless on top of that who are basically incompetent, and on top of that are the sociopaths of create their own ethic based on self-interest alone. Really though, I wanted to talk about some of the ways you can deal with working with a person like this. 1) Quit your job and find something better. This is an immediate, albeit risky solution to your problem. There is some risk for this solution though, you might be jumping into another equally bad situation. 2) Become a low performing loser in your company doing just enough to get by and keep your job. If you choose this path, you’ll probably want to make an effort to continue developing your skills outside of work. Most tech jobs don’t last forever and sabotaging yourself isn’t a good thing. 3) Go independent, be a consultant. Michael Church added a fourth layer to the model, the technocrat. The technocrat is driven to good work and to serve. The goal of the technocrat is a mutually beneficial relationship, their life isn’t dependent on the failures of others. I think the independent / consultant tech worker can potentially fit nicely into this role. 4) Have you ever had one of those managers that liked to act as a shield from all the bad stuff that rolled down from management? Finding one of those might help you out. They can at least provide a layer between you and the sociopath. Maybe you can find one of these in your company and transfer under that person. 5) Learn the secret language of the sociopath, power talk. This might leave you feeling a bit icky, but at least you’ll will be armed to navigate the kind of conversations that surround you. I think I know what I’d choose given these options, how about you?